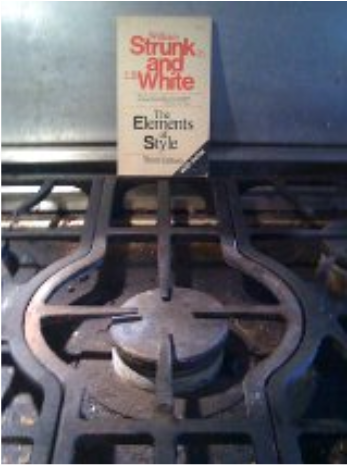 Here is a picture of my copy of The Elements of Style propped up on top of our stove top. I like The Elements of Style because it is to the point in trying to help you work with what you have to become a good writer. Mr. Strunk and Mr. White were economical, elegant, and relevant! I wish there were a book like this to help non-cooks work with what we have to become good non-cooks. Non-cooks who operate with this general style are the kings and queens of no-can-do. Or at least, of declaring no-can-do. First, there are those that can’t actually cook – these are the pan burners, the quiche ruiners, the chicken dryer-outers, etc. We lack technical skills. We also appear to lack the ability to acquire them. This might sound suspicious to some, this part about lacking the ability to learn. Well, try me. The can’t style non-cook is often also referred to as a Bad Cook. And then, there are those can’t style non-cooks who, on top of lacking technical ability lack psychological mettle. We can’t cope with cooking, cannot deal: we are kitchen anxiety people who are a little bit psycho in a compartmentalized way, avoiding cooking with something like animal instinct. Here you will find worry hovering in the space of the open refrigerator door as the kitchen anxiety oriented can’t style non-cook peers inside, wondering what the heck to do about dinner. Here you will find dread wafting over the stovetop as the kitchen anxiety oriented can’t style non-cook stands there freaking out, especially if there’s uncooked meat involved. Expecting the kitchen anxiety oriented non-cook of the can’t mode to make a normal, presentable dinner with out a fuss, internal or otherwise, and in a reasonable amount of time would be like demanding that she dismantle a ticking bomb. Less stressful, but still, like that. Especially if guests/kids/or a spouse are waiting. As it turns out, inability – both plain technical inability and psycho/technical inability -- can be very effective buffers between the non-cook and the discomforts, heartbreak, stress, and psychological drama of the kitchen. For this reason many can’t style non-cooks carefully protect and nurture their inabilities, and place faith in the fruitlessness of trying to learn to cook. Strategies along these lines include: not extrapolating from the kitchen knowledge they have been unable to avoid acquiring, not learning through trial and error, and definitely not signing on to the recipe exchange that’s going around amongst acquaintances over email. Shifting responsibility is a big one, too. Mitigating measures for the less brash, more grown-up, more evolved can’t style non-cook include compensating with other domestic abilities, apologizing elaborately for cooking lameness, deflecting attention from sub-standard cooking with entertaining dinner conversation, and accepting help from others, whenever possible. When not possible: crackers. When not possible plus children: frozen chicken nuggets. You can get the kind made out of chickens which, though unfortunate in their lot, at least did not have antibiotics or hormones in them. That way, it’s kind of like reverse cooking, because there are ingredients missing. The won’t style non-cook is won’t in action whenever she can get away with it. The rest of the time, she is won’t in attitude as in “won’t if I don’t have to.” It is a refusal of the heart, though not always a refusal of the oven mitts. It is a grammatical stance toward future cooking experiences, and as most non-cooks are well aware, dinner is almost always in the dangerously near future. These are the people who consider themselves non-cooks because they don’t like to cook and know it. She may or may not be able to tell you exactly why off the top of her head, but give her a few minutes and she will come up with a list. It will probably be detailed. If it’s general, that’s because she doesn’t want to bore you with the specifics of how much she hates the roar of the exhaust over her stove or how grossed out she is by the way a little of the egg shell always ends up in the bowl when you crack them, and then you have to fish out the slippery slimy thing with the tip of your finger. She’s probably thinking you have enough cooking woes of your own without hearing the nitty gritty of hers. It should be noted that the won’t cook style non-cook isn’t necessarily uniformly won’t in her attitude. Ditto in her action. There might be some things she likes to make, or some times she doesn’t mind cooking. Just as Mr. Can’t Cook can actually pull it out of the bag for a barbecue, Ms. Won’t Cook is happy to throw herself into her best friend’s potluck supper bachelorette party. But the won’t cook style non-cook, most of the time and around most of the dishes, is an I-don’t-want-to-cook-Wanda, sometimes vocal about it and sometimes obliged or resigned to stew in her non-cooking juices and deal with the realities of life. Initially, it might seem like the don’t cook style non-cook is an evolved won’t style non-cook. It’s so true that in a perfect world a strong, clear, consistent won’t would lead to don’t, but in the actual world full of obligation, responsibilities, forks, knives, and spoons, the more frequent path to don’t style not-cooking is luck. Lucking into it! Lots of times, this means pairing up with a cook, or even a less dyed in the wool don’t style non-cook (a won’t, for example, who knows she has to). The don’t style non-cook does not feel obligated to cook, does not have a sense of responsibility around cooking, and is confident that someone else will handle shaping the ground beef into patties. The don’t cook style non-cook is by far the most passive of the three basic styles. It speaks of a removal or disconnectedness from worldly cooking concerns. Most don’t cook style non-cooks would never be reading anything even distantly related to cooking, even something about not cooking. What I’m trying to say is that they really just don’t care. However, it occurs to me that there are definitely some don’t style non-cooks who are big eaters, even food people, just not the kind who cook. And these kind of very pro-food non-cooks might take an interest in reading about cooking because it relates to eating. So I am reminded that nothing, not even not coking, is uniform. Although unsung, the don’t cook style is an important non-cook mode and must be included here for reasons of rigor and fairness. Even the passive non-cooks, unconcerned with their non-cook identities and not so curious about where they fall in the non-cook continuum, are entitled to their category. Incidental advice to non-cooks of all styles, especially the don’t style non-cooks themselves: Be careful about falling in love with one of these. To get a sense of your basic non-cook style, say each of the following sentences out loud. Speak clearly and firmly. When you say each sentence, try to sound both convinced and convincing. Use a persuasive yet neutral tone. Whichever sentence feels the most true corresponds to your basic non-cook style. If no one style feels totally comfortable, you are certainly not alone. In many actual non-cooks, these styles are linked, interconnected, and not always distinguishable from one another. That’s why the non-cook personality often appears to be a complex tangled mess of issues, concerns, and messed up dinner parties. But it is fun to dwell in these elements of non-cook style and try to see what’s what. By building on the three basic non-cook styles and their interconnection we can really get into it and begin to describe many various and specific... non-cook types!